The following information has been received from Mr Stephen Mann who came across it when under taking his own research. What he has found pre dates the work undertaken by Joe Hooton, Mr I. A. Potter, Mr D. Latham, and he very kindly sent his findings to us. In the the 1800s there were a number of chess clubs in or near Derby, such as the Derbyshire Chess club and the Midlands Institute Chess Club, Derby YMCA Chess Club, British Workman Chess Club, Duffield Chess Club and so on. With the turn of the century' some smaller towns north of Derby formed chess clubs. The Matlock Liberal Club already boasted it's own chess club. while Matlock Bath, little over a mile to the south, was home to Matlock Bath and District Chess Club. These early Matlock clubs may have undergone some changes or even demise, as in January 1911 there appears reference to the "newly formed" Matlock Chess Club. At Dronfield, between Sheffield and Chesterfield, there was a Dronfield Chess Club formed on 13/11/1900. A Belper Chess Club seems to have been formed in late 1901, Though possibly in early 1902. Its first match was played on Monday 10/02/1902, against Derby YMCA, and its first annual general meeting was held on Friday 26/09/1902. Chess Club are invited to communicate with Mr. A. E.
Hopkins, St. Helen Lodge Chesterfield"
The gentleman mentioned was Arthur Ernest Hopkins (born 26/08/1855, in Uppingham, Rutland; died 18/04/1925 in Matlock), who was already a solicitor when he arrived in Chesterfield at some time from 1891 to 1898. Kelly's 1899 Directory of Derbyshire listed Arthur Ernest Hopkins, solicitor and commissioner of oaths, & registrar and high bailiff, with office premises at the County Court, Market Hall, Chesterfield, and his home at St. Helen's Lodge. (1 St. Helen Street.) Chesterfield. or two enthusiastic players, and Mr. A. E. Hopkins, St.
Helen's Lodge, has undertaken the part of secretary. "Lovers of chess - and there are surely some in Chesterfield district - will be glad to learn that steps are being taken for the formation of a club, Mr. A. E. Hopkins is taking the initiative in the movement, and ladies and gentlemen who desire to become members of the club are invited to communicate with him (at) St. Helen's Lodge. The expenses are not expected to be heavy, and the subscription will be merely a nominal one." "People interested in chess will be pleased to learn that the Chesterfield Chess Club have obtained a promise from Mr. H. E. Atkins, B.A., who is a world renowned notoriety as an exponent of the royal game. to visit Chesterfield on Saturday, the 7th October next, and play simultaneous games with members of the local club. Mr. Atkins, who is a quiet young man, was a colleague of Mr. J. Marsell, at the Wyggeston School, before the latter moved to Chesterfield, and it is through Mr. Marsell's good office that Mr. Atkins has been induced to visit Chesterfield. Mr. Atkins, who, of course, is an amateur, was for three years president of the Cambridge University Chess Club, and last year played second board for England in the cable match against America, winning his game. He has since had other brilliant successes. The object of Mr. Atkins visit is to popularise the game of chess in Chesterfield., and I am authorised to say that anyone interested in the game, whether members of the club or not, will be welcomed to the exhibition free of charge on production of a ticket, which may be obtained from Mr A. E. Hopkins, the Hon. Secretary. I hope the announce next week where the event is to be held." Leicester born Ernest Atkins was 27 years of age at the time, and still resident in Leicester, though in 1909 he moved to Huddersfield, where he lived for for about 28 years until returning to his native Leicester in 1937 give or take a year. He was the 1897 Amateur Chess Champion, and in time he was to win the British Championship nine times. "As- stated last week, Mr Atkins, B.A., the celebrated amateur chess player, will visit Chesterfield Saturday evening week, and play simultaneous games with members of the Chesterfield Chess Club. Mr. Atkins has expressed his willingness to play twenty games simultaneously. The Trinity Institute, Newbold Road, has been secured for the occasion, and anyone wishing to witness the interesting event will be able to obtain an admission ticket from Mr. A. E. Hopkins, Hon. Secretary of the local chess club. The games will be commence shortly after seven o'clock." The appointment day arrived, and, to remind people, the Derbyshire Times of Saturday 07/10/1899 carried the following notice "Coming Events". Road, Chesterfield, games with Mr. Atkins." Last Saturday night, Mr. H. E. Atkins, B.A., the renowned amateur chess player, visited Chesterfield, on the invitation of Chesterfield Chess club, of which Mr. A. E. Hopkins is Hon. Secretary, and played twenty-one games simultaneously with local chess players. The gathering took place in the Holy Trinity Institute, Newbold Road, and there was a large attendance of interested spectators. Mr. Atkins won every game, with the exception of that with Mr. Wilson, which was left drawn. The Rev. Mr. Botterill, of Newbold, played his game out to the end, but ultimately was compelled to resign. Mr. Atkins expressed the opinion that the Rev. C. Dyson, of Barlow, was the best player of the club. The games commenced at half past seven, and the last was not concluded until three minutes to twelve." The Rev. Cornelius Dyson (born 1850/51, Birmingham; died 02/07/1923, Barlow) was perpetual curate of Barlow, Derbyshire, from 1879 to his death. He was a member of Dronfield Chess Club as well as the Chesterfield Chess Club. Chesterfield Chess Club played an away match against Dronfield Chess club (which was formed on Tuesday 13/11/1900, and of which A. E. Hopkins, who played in the match for Chesterfield, was a vice- president), played at Dronfield on Wednesday, 13/03/1901. How long this Chesterfield Chess Club lasted is unclear. Ernest Hopkins became mayor of Chesterfield in 1904, and perhaps he gave up running the chess club about that time. late life member, Mr. J. W. Mearns, in 1902". Opening the Season at Chesterfield. A new departure has been made by members of Holy Trinity Institute, Chesterfield, in the formation of a Chess Club. There are about a score of players of the game connected with the institute, and now they have got their club into order they are anxious to arrange matches with neighbouring clubs. To inaugurate the season an opening match took place at the institute on Tuesday evening, when Mr. J. V. Newton and Mr. Hinckley captained teams of members. The result was a win for the latter team by five games to two, and some of the games were very keenly contested, in particular that Mr. Hinckley and Mr. Price, which lasted two and a half hours." Of the players listed J. W. Mearns is recognisable as a future member of the Chesterfield & District Chess Club. Again it is unclear how long this chess club lasted. "In 1906 Mr. F Betts, then the local surveyor of taxes, formidable club which met in Mr. Gilberthorpe's hairdresser's shop in the Market Hall, and later in the now demolished West Park Hotel." It is not clear whether this was in fact a continuation of the chess club started by Arthur Ernest Hopkins 1998, perhaps switching in 1906, to use of Mr. Gilberthorpe's barber's shop as a venue. "Mr F. Betts" was Frank Betts, who was born in the vicinity of Coventry in 1882, married Annie Rebecca Farrand at Coventry in 1905, and moved to Chesterfield and took up the post there of Surveyor of Taxes. The Tax office where he worked, was at 12, Corporation Street. Kelly's Derbyshire Directory listed one David Cram as Surveyor of Taxes, but the 1908 directory listed Frank Betts in that post, so the arrival of the latter gentleman in Chesterfield seems likely to have been 1905 give a year or two. It was in Chesterfield that his daughter Barbara Ann Betts was born on 06/10/1910. His stay in Chesterfield was not long, as his job soon took him to Hull, then to Pontefract, and then to Bradford, where he was noticeable as a political activist and as editor of the left-wing journal the Bradford Pioneer. (Daughter Barbara Betts was educated in Bradford, then at Oxford University, and eventually married Ted Castle, and as Mrs Castle she became Secretary of State of Employment in the Labour government of Harold Wilson, later being Minister of Transport, and becoming Baroness Castle of Blackburn, before dying on 03/05/2002. Frank Betts thought to have died in Nottingham, in 1945, or else in Sussex in 1947. Mr Henry Gilberthorpe was listed in Kelly's 1908 Derbyshire directory as a hairdresser with his business premises in Market Hall Chambers Chesterfield. He was born in Chesterfield in 1849, married Annie Sophia Tyas at Derby in 1873, and died in Chesterfield on 21/02/1919. Again we do not know whether this chess club was the forerunner of our present day chess club, or how long this chess club lasted. It was about 22 years before 1924 that an enduring Chesterfield Chess Club came into being, but all earlier clubs in Chesterfield had apparently ceased to be. A letter to the editor of the Derbyshire Times, published on Saturday 20/09/1924 (page 1) served as a notice of a meeting, on the following Monday, which inaugurated the current (2015) Chesterfield Chess Club. "Sir,- Most towns of the size of Chesterfield possess more than one chess club. In order to form a chess club in Chesterfield a meeting is being held at 7pm. Next Monday, September 22nd (1924) at the settlement, Packers Row, Chesterfield. It would help matters very much if you would allow columns to be used to further this object and to offer an invitation to anyone interested to attend the meeting. Yours, etc,"
The name "J. D. Robinson" appears to be in error. The address given was that of Victor Owen Robinson, and as one of the relatives had the initials "J. D." or similar, it seems probable that the letter was signed "V. O. Robinson" and that the signature was mis-transcribed. Accordingly, on Monday 22/09/1924, the Chesterfield & District Chess Club was inaugurated at a meeting chaired by Colonel Victor Robinson. Then the Mayor of Chesterfield, Alderman William Edmund Wakerley, was appointed President, with Colonel Victor Robinson as the vice-president. William Edmund Wakerley (born 1985, Sheffield; died 05/11/1940s Chesterfield) was a solicitor who was twice Major of Chesterfield, in 1923-24 and again in 1924-25. Victor Owen Robinson (born 19/05/ 1891, Chesterfield: died 1972, Chesterfield) had been awarded the Military Cross three times during the first World War. Chess playing older brother of Victor Owen Robinson was Robert Robinson (born 13/09/1886, Brampton, Chesterfield; died 08/02/1975, Great Nissenden). At the time Chesterfield & District Chess Club was formed, Robert Robinson was professor of Chemistry at the Manchester University. On Monday 07/12/1925, this professor Robert Robinson gave a simultaneous display against members of the club, at the Station Hotel, Chesterfield, playing 19 games of which he won 15, drew 1 (with E. Northam) and lost three (to A. E. Raynes, V. O. Robinson and W. E. Wakerley). Robert Robinson went on to be knighted in 1939, to win a Nobel prize for Chemistry in 1947, and to be awarded the Order of Merit in 1949. The family business (Robinson & Sons Ltd) manufactured surgical dressings, cardboard boxes etc. It also manufactured those flat "Portland" pocket chess (& draughts) sets, which were from stiff card, and they were popular with correspondence players. The First club night was held on the Monday the 6th of October 1924 at the Station Hotel. On Monday the first October 1928, at the fourth Annual General Meeting, with Major V. O. Robinson Chairman, the Treasurer announced a slight reduction in the balance in hand on the last season. The entrance fee which was 2/6 was abolished and the annual subscription remained at 5/-. 9.5 - 2.5 Chesterfield C.C. The Sheffield Chess Club had some of Sheffield's top players of the day, and Chesterfield's score of 2-2 on the top boards show their top players were of comparable strength. Frank Ernest Raynes (born 1905, Chesterfield; died 1955, Cockermouth) was the father of Frank Raynes. Another member of the club, John Henry Stockton (known as Henry; died 01/1/1963, Chesterfield), was the son of John Thomas Stockton, who was brother to Arthur Eric Raynes's wife, Emily Raynes nee Stockton. The Wilsons, who may have been related, are difficult to identify. In the absence of a local league, inter-club match-play was a relative luxury, involving somewhat remote clubs, so in the autumn of 1925, there was formed the Chesterfield & District Works Chess League. There were originally six "works" teams, sensu stricto, mostly headed by stronger members of the Chesterfield & District Chess Club, and there was additionally a team of "leftovers" from Chesterfield & District Chess Club. Sheepbridge works - With James Williams Mearns on board one. Plowright's - With Arthur Eric Raynes on board one. Robinson Works - With V O Robinson and C Robinson top boards. Coporation - With Frank Raynes and John Henry Stockton on top two boards, and Eric Duce Paintin (aka E Paintin, junior - son Edwards Lemuel Druce Paintin) lower down. Chesterfield Chess club - along with Post Office (A.G.D.) and the Police, joined Chesterfield & North Midlands League or participated in the Sheffield Works league. Corporation - During the 1980s, they participated in the Sheffield Works League, and each year they attended the annual National Public Service Vehicle Chess Congress at Birmingham, the trip sponsored by Chesterfield Corporation Transport Social Club. By special invitation simultaneous display of chess was performed by international master M.Basman 1983, and again by grandmaster A.Miles 1984. In the year 1985, G.Peters won the annual 'best game award'. Another important development in 1925 was the start of a weekly chess column in the Derbyshire Times. This may have been inspired by Bill Batley's column in the Yorkshire Telegraph & Star, of which it was to some extent reminiscent. It started with numbered chess problems and later, these usually went on given a name, then a match result was published when available. The first column appeared on page 12 of the Derbyshire Times of Saturday 14/11/1912. As was common with such chess columns, the editor's name was not given. Enigmatically, the column of 27/02/1926 had, immediately after the "Chess" heading, the line "by R. W. Clark (Saskachevan)". This was however, misplaced type which should have been placed as attribution of a chess problem, printed lower down, by the composer Robert Winslow Clark. The editor was apparently Joe Bunting. Individual championship of Chesterfield was instituted, and Victor Owen Robinson presented a trophy in 1925 for the winners. In the early years Arthur Eric Raynes (known as Eric; born 1906, Chesterfield: died 1955, Chesterfield) dominated the Chesterfield Championship. Joe (Never Joseph) Bunting (born 08/02/1898, Chesterfield: died 11/04/1958, Chesterfield) was fairly well known in his day in the world of chess problem composition. Cyral Maurice Greenhalgh was born on 16/09/1908, in Glasgow, and died in Chesterfield. On Monday 23/10/1933, A. E. Raynes gave a 16-board simultaneous display to local players and visitors at Chesterfield Chess Club meeting place, Hadfield's cafe. He won 12 games, drew 1, and lost three. Those to whom he lost to were Edward Lemuel Druce Paintin (aka "E. Paintin senior"), Frank Knowls Evans, and Frank Raynes all of Chesterfield Chess Club. (Yorkshire Telegraph & Star, 28/10/1933). Edward Lemuel Druce Paintin was born in 1871, at Deddington, Oxon., and died on 01/11/1939, at Witney, Oxon., though resident still in Chesterfield, shortly after attending the funeral of his sister in Witney. A latter "serial winner" of the Chesterfield Championship was Douglas Saunderson (born 1920, Chesterfield; died 26/ 04/2008, Chesterfield), who won the title 13 times, as well as serving for many years as club secretary. He like Joe Bunting, was known in the world of chess problem composition. He was also active locally in amateur astronomy. In the past, club members were required to win several club tournaments before being eligible to enter for the Club Championship. Chess in Chesterfield enjoyed a surge of interest during 1970s when the American Bobby Fischer won the world chess championship. As a result, membership of the club increased. In the year 1977 the club committee decided to restructure the club championship tournament into three divisions, namely Club Championship, Swiss Tournament, and the Major Tournament. The strongest and the most competitive Swiss Tournament organized by Chesterfield Chess Club was in the year 1976 season. How they finished was printed in the chess bulletin. The top three were promoted to be in the Club Championship for the following season. "The winner Mr.I.Coleman was pressed very closely by Mr.M.J.Barrett and Mr.G.Peters, both newcomers to the tournament, and two juniors players, Mr.M.Johnson and Mr.S.Deakin. Our two lady players, Mrs.McDermott and Miss Rogers (who finished 17th), both did well and two other young players who showed promise were Mr.G.Furniss and Mr.Edney. Three of the competitors who are still active today (2016) are; Mr.M.Johnson, Mr.G.Peters, and Mr.M.Fanshawe. The D.C.A. meets twice a year, at an open Annual General Meeting, normally held in June, when reports and trophies are presented for the past year's events and officers are elected, and at the Council meeting in September, attended by representatives from other Chess Clubs based in Derbyshire, when next year's programme is finalised. Derbyshire Chess League, this competition, at present is restricted to Chess Club based in the County. Each team is made up of six players (now made up of four in the Derbyshire 'Derby' Trophy), Chesterfield Chess Club who are regular participants in the league, were the first winners of the 'High Peak Vase' trophy which was presented to the Derbyshire Chess Association by the 'High Peak News' Buxton Advertiser in 1947. Over the years, the best annual coverage of the campaigns made by Chesterfield, was reported by I. A. Potter in the year 1999 (48th bulletin) with a table of team results. "Champions!" (1999) We won despite drawing with Derby/Mickleover and losing to Breadsall team which contained 2 players from Bradford & 1 from Rugby. Long Eaton achieved the same points as us but had a board count of 31, against our 36. Our count was helped by Charnwood Knight's default which was probably compensation for when lost out in reverse circumstances last year." Captain's report by Bill Ramsden O B E.
In the year 2009, Chesterfield Chess club entered an additional team, named Chesterfield B, into the Third Division of the Derbyshire League. In their first year they came top of the Third Division and gained promotion to the Second Division. The following season they gained promotion to the First Division and in 2012/13 they won the Derbyshire League. Chesterfield B Team were the only B Team to have won the Derbyshire league in fifty years. School Chess League was formed 1950, organised by the then Secretary Mr H. J. Stockton. The Trophy was presented by the late President Colonel V. O. Robinson, the first winner being Chesterfield School. In 1966, a Trophy for School-Juniors was donated by Dr Bron Skibinski (known in the club as Bron Ski'). Both him and his son, David were club members. In the following year 1967. David Welch, one of our younger club members at the time, gave a trophy for the Schools under 16. He became a teacher and left the district to teach in Liverpool. Apart from our former President R. J. Hooton, Vice President John T. Salt, who passed away on the 7th of November 1982, was the longest serving member of the chess club. He joined in the year 1934, as a young player, and is best remembered, along with Mr D. Saunderson for organising the 1950/51 British Chess Federation Buxton Chess Congress. 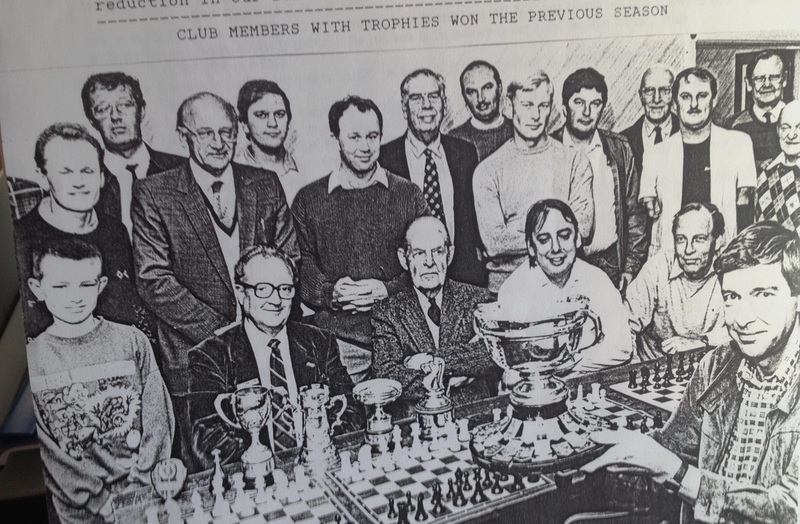 Joe Hooton who, in 1991, completed 60 years as a club member of the Chesterfield Chess Club. To commemorate his service, Joe was made a 'Life Member' from 1991 to 1994. Mr John Littlewood from Sheffield commenced judging the 'Best Game Award' for Chesterfield Chess Club in the year of 1959 till 1995 spanning 36 years. The L. Senior Trophy for the best game award, was presented by Mrs L. Senior in memory of her late husband who had been a Club Treasurer for 20 years. In 2005 unfortunately the competition ceased to exist along with the last bulletin printed. The Constitution of the rules for the Chess Club were passed at the 1949 Annual General Meeting. Since then they were and amended by Mr Bill Ramsden O.B.E. & Mr. G. Peters. Passed by the committee in the year 2000. Updated since by A.Mort. Passed by the committee in the yesr 2016. "Welcome to Bulletin 53!!." with the 'Spital Hotel' in colour pictured on the front cover. The bulletin begins by printing an abundance of games played during the season, and the judging of the annual 'Best game Competition' which was won by Trevor Webster, and judged by David Latham. Further coverage included the Easter External Lightning Tournament, together with Bill Ramsden's O.B.E. Memorial Presentation. "Bill's family who were present, have very kindly agreed to present an attractive chessboard and set in his honour to the Chesterfield Chess Club." "Congratulations, to D. Latham who scored maximum points to win the tournament. It was an extra bonus to see a Chesterfield player winning this tournament for the first time. The top board in each round was played out on the 'Ramsden set' and these games were recorded to form a mini tournament, with Mr Mike Alcock the winner of 'the best game prize'." Middle pages of the bulletin was taken up by news of chess activities in South Yorkshire and further coverage of Chesterfield's league results in the Sheffield Leagues. furthermore emphasising that Chesterfield Chess club are the present winners of Derbyshire League Trophy. A full page was devoted to Mike Alcock who won the 2004 Chesterfield Chess Championship Tournament, and a thriller of a game published between Mike Alcock and David Latham from the club championship tournament. "Congratulations go to the outright winner, International Master Mr Hubert Mossong of Luxembourg, who usually visits Chesterfield at this time of the year. Steve Housley, who showed some of his true form, took second prize. Congratulation to Richard Newman, the only Junior who took on most of our strongest players, earning one and a half points out of five games before retiring. After the tournament Mr Mossong was so fired up that he obliged us with three quick round of simultaneous chess display, just loosing the odd game. In the early years1970s a talented group of juniors, encouraged by David Andrews, some of whom achieved County Status, where keen members of our club. They played as a team in the 'Chesterfield League' which was consisted of six players to a team, later was renamed as the (Chesterfield & North Midland league). The only time they lost a match when transport wasn't available to get them to some far distant towns away from Chesterfield which also meant getting back late. A note from the league controller:- "Chesterfield Juniors defaulted their away games to both 'Sutton Centrer' and 'Cresswell Chess club' due to lack of transport'. Worksop who won the League only faltered twice, both times to Chesterfield Juniors, they have drawn their (home match 3-3), and lost their (away match 1-5). The Worksop match result reflects on the true strength of the Juniors. Chesterfield Juniors did not produce their best players in all of their Scheduled fixture dates, and lost further points to 'Sutton Brook Street' (home match 3-3), and (away match 1.5 - 4.5). Chesterfield Reserve Team, were Captained by Mr I. A. Potter, who also provided transport for their away matches. There was a pool of eight players who were not regular players for the Sheffield 3rd Division (Batley Meek League), or the Sheffield 1st Division (Davy league). In 1980, Chesterfield Juniors disbanded and amalgamated with Chesterfield Reserves to form a team in the newly named 'Chesterfield & North Midland League'. For almost a decade, Chesterfield club tried their hardest to win this trophy, because of the fierce competition, especially from Worksop. In the year 1984, The Chesterfield club strengthened their challenge by splitting their team in to two, the 'Chesterfield Knights', and 'Chesterfield Bishops'. Over the years both teams finished second or third in the league. Then in 1987/88 season both teams finished top of the league. Finally Chesterfield (Bishops) captained by M. J. Barrett, won the league. Congratulations goes to Chesterfield (Bishops) who only lost one match, all season, to Clay cross (Castles). Chesterfield (Knights) just missed out after a long unbeaten run by losing to Worksop, and Chesterfield (Bishops). The following season (1989) both teams were discontinued and a new team was formed, captained by Mr Dean Hartley to the year 1990. In 1994 Mr I. A. Potter (captain) took over and ran a team to year 1997, when they won the 'North Midlands Knock-out Cup'. In the Semi-final against Clay Cross, Chesterfield scraped through, with a better board count. In the final against Worksop "We won the cup!!!". After this win Mr I. A. Potter (captain) resigned from running the team, and as for the Chesterfield chess club, the desire to participate in this league was no longer there. Chesterfield & District Chess club existed for fourteen seasons before it first became affiliated to the Sheffield & District Chess Association, which it did start of 1938/39. As a new club started in the second division (Weston Trophy), and the strength of the team soon became clear and finished first. Second World war then intervened, and the sixteenth Annual General meeting of December 1940, at the Falcon Restaurant, with C. F. Simmonds esq in chair, a discussion started about election of officers for the coming year, when the 'air raid sirens' sounded and the meeting was abandoned. Chesterfield did not resume participation in the Sheffield & District Chess Association's activities until the third season after the war, that of 1946/47 the club won the Weston Trophy (division 2), so gaining promotion to the Davy Trophy (division 1). In 1947-48 the club entered a second team in the Weston Trophy, but then withdrew that second team, after one season, whilst retaining the first team. Chesterfield remained in the Davy Trophy, winning it in the three consecutive seasons along with the Derbyshire League Trophy 1951-52, 1952-53 and 1953/54. In the1970s, Chesterfield was not strong enough to give good account of her self in the Davy Trophy (division 1), yet they were too strong for the Weston Trophy (division 2). Chesterfield finished bottom of the Davy Trophy at least twice in the 1970s (1976 and 1977) but escaped relegation due to the fact that University C, who won the Weston Trophy, were ineligible to take promotion, due to a club not being allowed more than two teams in any division. In 1978, that safety net disappeared, and Chesterfield relegated from the Davy Trophy. Nevertheless, the team bounced back, winning the Weston Trophy in 1979. They remained in the Davy Trophy, wining it in 1990, they struggled to stay up in the league right up to 1996, when then again relegated, but once more bounced back by winning the Weston Trophy in 1997, following up with winning the Davy Trophy in 1998. During the drought years, Joe Hooton often reminded us of his treasured memories, when in the 1950s Chesterfield 'old boys' dominated the Sheffield Davy league. He boasted of the kindred spirit which existed throughout the team. Unfortunately, he was not there to witness the club's success in the Davy League in the 2011/12 season. That team, superbly captained by Martin Howard, broke all known records, and finished top of the Davy League with almost maximum points, drawing just once with Ecclesall Chess Club. When Chesterfield A team first met Sheffield Nomads A team in the 2011/12 season they were out graded on every board, but that did not deter the Chesterfield players who won both the home and away matches 5-3. There were 111 games played that season 2011/12 by regular Chesterfield players. They won 50, drew 47, and lost only 14. The 'Captain's Prize' competition was awarded to Mike Johnson who played 15 games, and scored 21 points. Steve Bracey played 13 games, and scored 20 points. Steve Housley played 11 games , scored 19 points. Andy Mort played 11 games, and scored 16 points. What is outstanding about the above results?. All four players did not lose a single game during the 2011/12 season in the Sheffield Davy League. Chesterfield has remained in the Davy Competition since then to the present time, winning it in 2003, 2010, 2012, 2015, 2017. A second team was entered in the Batley-Meek Memorial Trophy (Divison 3.) In the 1957/58 season Chesterfield B won the Batley-Meek gaining promotion to the Weston Trophy 1958/59, but drooped out after that season. Chesterfield B won the Weston Trophy in 1990, the Athenaeum Cup (Division 4) in 2007, came second in the Batley-Meek League (Third division) in 2012, and won the Weston Trophy (Second division) 2014. Unfortunately Chesterfield Chess Club could not support two teams in the 1st Division and as a consequence they had to turn down promotion. The Richardson Cup was fought out mainly by the top players in each club. Chesterfield won the Richardson Cup (knockout) in 1947,1948,1949,1981,1982, 1986,2005, and 2008. To extend the competition in the year 2007/8 season a second league was formed namely Richardson Plate (knockout). The first entry by Chesterfield to the 'plate competition' was made in the 2010/11 season. Of clubs presently affiliated to the Sheffield District Association, Chesterfield Chess Club (they dropped the "and district" at some stage), has the longest continuous affiliation to the present - since 1946/47. Some chess clubs close down during the summer. However, Chesterfield chess club found all year round league chess in the Sheffield District Association. Summer Chess league was first formed during the summer of 2009. In the year 2011, the league was extended into two divisions 1st and 2nd. In that year 2011 and in 2012, Chesterfield A came top of the first Division. An additional team, Chesterfield B, was entered into the first division and came top of the First Division in 2013. In second place was Chesterfield A team. A Chesterfield C team was entered into the 2nd division in the year 2015, which proved to be popular with our new members.